Verdant Kitchen – Award winning Savannah Snaps w/ Organic Ginger! Verdant Kitchen Savannah Snaps made with organic ginger! 2015 Flavor Of Georgia Award winner! Shown in this photo with Gary Black, Commissioner of the Georgia Department of Agriculture, Ross Harding of Verdant Kitchen and Verdant Farms proudly accepts the award for the Flavor of Georgia best of “Snack Foods” category for the popular Savannah Snaps with Organic Ginger! Verdant Kitchen is one of the first producers to achieve organic certification in PREP’s shared kitchen for all of their products. PREP is licensed by the USDA, Georgia Department of Agriculture and the GA Dept of Health. I-85/I-285 ITP, 15 minutes from most areas of Atlanta. PREP Cook-Create-Connect provides Private Kitchens for Commissary, Catering and Food Production as well as a shared kitchen workspaces. PREP is a culinary accelerator platform which reduces the barriers to entry and provides mentorship for food entrepreneurs bringing their products and services to market. PREP provides test kitchens resources, food procurement and guidance to a talented and creative class of entrepreneurs. These are specialty food producers, baker, caterers and mobile food service operators, along with the next generation of food artisans. PREP is a privately held company based in Atlanta, GA.
https://www.prepatl.com/wp-content/uploads/2015/03/verdant-kitchens-specialty-food-producer-savannah-snaps-ginger-turmeric.jpg 720 720 doug marranci https://www.prepatl.com/wp-content/uploads/2018/09/PREP-LOGO_WEB.png doug marranci2015-03-25 17:43:332019-01-29 17:14:20Verdant Kitchen - Award winning Savannah Snaps w/ Organic Ginger! 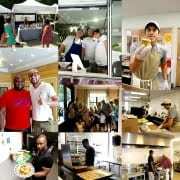 Shared Kitchen Project - Article in USA Today about PREP Atlanta!